Learning Outcome To practice technique of answering interpretation source questions To practice technique of answering interpretation source questions. 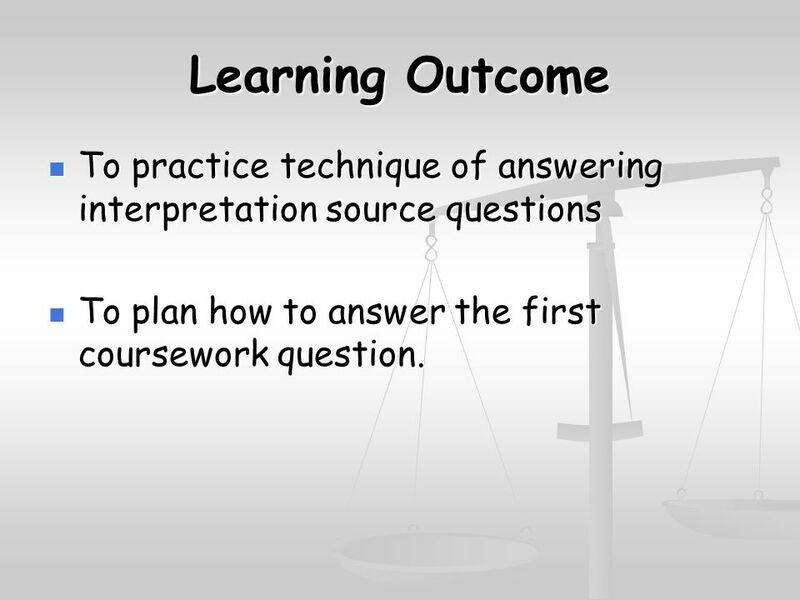 1 Learning Outcome To practice technique of answering interpretation source questions To practice technique of answering interpretation source questions To plan how to answer the first coursework question. To plan how to answer the first coursework question. 2 How valid is this Interpretation of the Battle of the Somme? A considerable portion of the German soldiers are now practically beaten men, ready to surrender if they could, thoroughly tired of the war and expecting nothing but defeat. It is true that the amount of ground we have gained is not great. That s nothing. We have proved our ability to force the enemy out of strong defensive positions and to defeat him. The German casualties have been greater than ours. Part of a report written in December 1916, sent by Haig to the British Cabinet about the aftermath of the Battle of the Somme. 3 How to answer the question – Part 1 Read the content of the source carefully. What is it saying happened? What is it trying to suggest? Read the content of the source carefully. What is it saying happened? What is it trying to suggest? Write about what the source is saying (surface facts) and whether this fits in with what you know. Write about what the source is saying (surface facts) and whether this fits in with what you know. Write about what the source is implying and whether this fits in with what you know. Write about what the source is implying and whether this fits in with what you know. Try to show both sides of the argument. If there is some evidence to support Haigs view use it! Then show the other point of view and support it with evidence. Try to show both sides of the argument. If there is some evidence to support Haigs view use it! Then show the other point of view and support it with evidence. 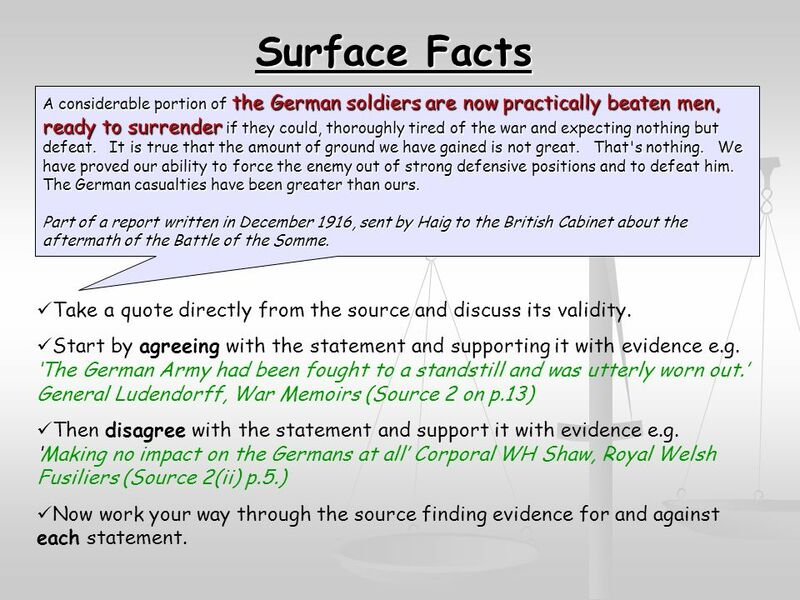 4 Surface Facts Take a quote directly from the source and discuss its validity. Start by agreeing with the statement and supporting it with evidence e.g. The German Army had been fought to a standstill and was utterly worn out. General Ludendorff, War Memoirs (Source 2 on p.13) Then disagree with the statement and support it with evidence e.g.Making no impact on the Germans at all Corporal WH Shaw, Royal Welsh Fusiliers (Source 2(ii) p.5.) 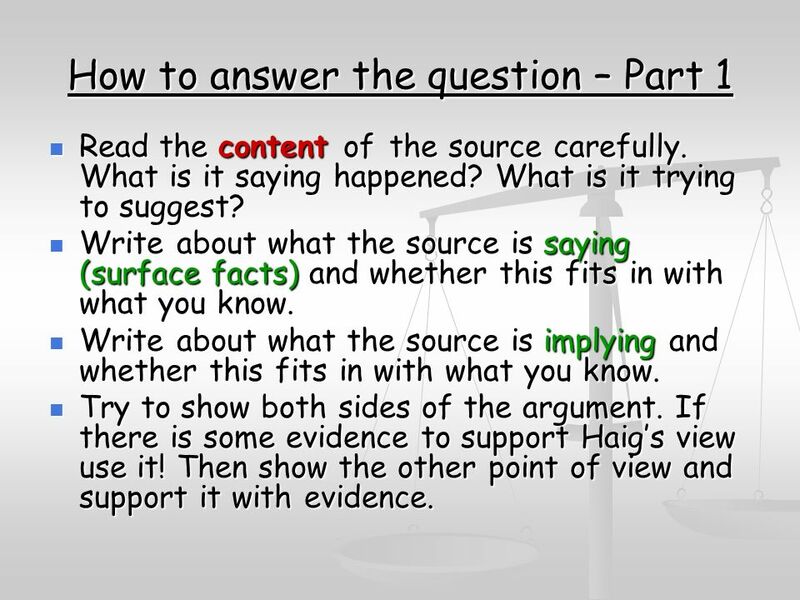 Now work your way through the source finding evidence for and against each statement. A considerable portion of the German soldiers are now practically beaten men, ready to surrender if they could, thoroughly tired of the war and expecting nothing but defeat. It is true that the amount of ground we have gained is not great. That's nothing. We have proved our ability to force the enemy out of strong defensive positions and to defeat him. The German casualties have been greater than ours. Part of a report written in December 1916, sent by Haig to the British Cabinet about the aftermath of the Battle of the Somme. 5 Implications What is the overall message of the source? What is Haig trying to suggest? The obvious answer is that the Battle of the Somme was a success! Now compare this suggestion with your knowledge. Write a paragraph saying whether this implication is a valid one. 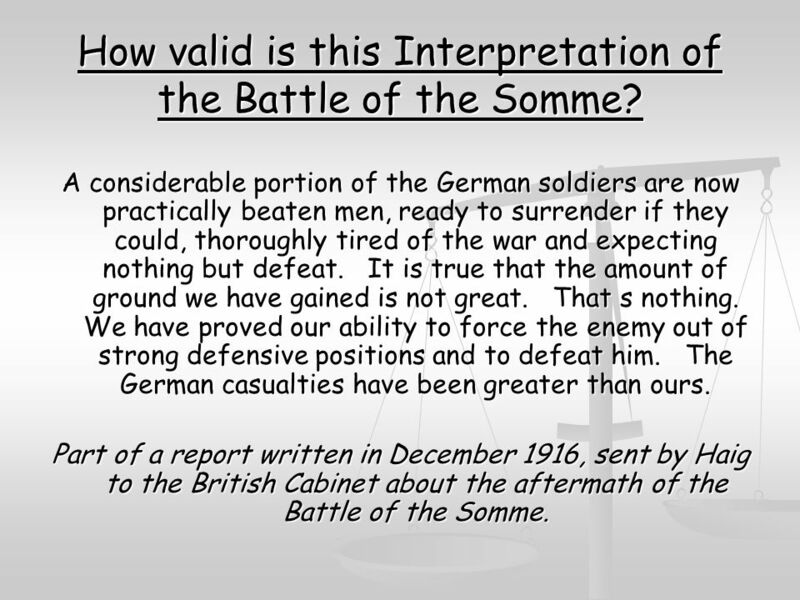 DO NOT make the mistake of answering the question Was the Somme a success?. Keep referring back to the actual question. Use the words valid, Haigs interpretation, implication etc. A considerable portion of the German soldiers are now practically beaten men, ready to surrender if they could, thoroughly tired of the war and expecting nothing but defeat. It is true that the amount of ground we have gained is not great. That's nothing. We have proved our ability to force the enemy out of strong defensive positions and to defeat him. The German casualties have been greater than ours. Part of a report written in December 1916, sent by Haig to the British Cabinet about the aftermath of the Battle of the Somme. 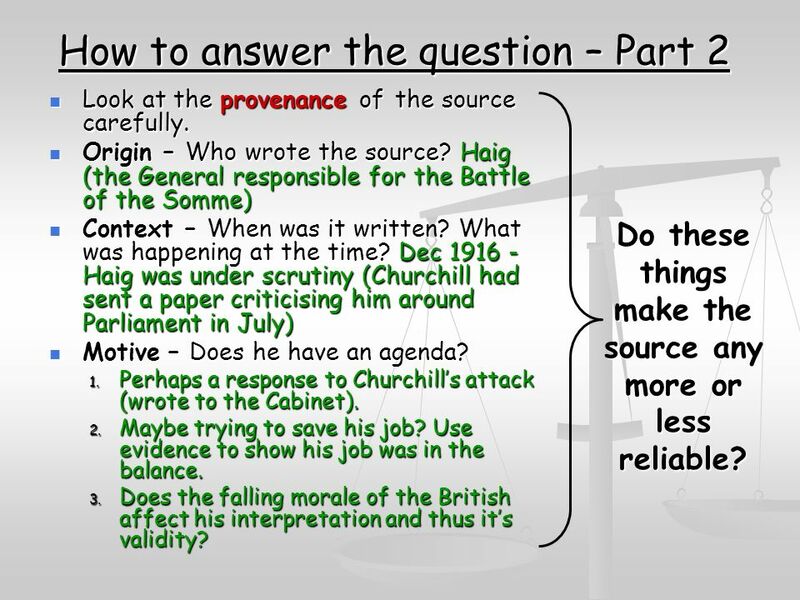 6 How to answer the question – Part 2 Look at the provenance of the source carefully. Look at the provenance of the source carefully. Origin – Who wrote the source? Haig (the General responsible for the Battle of the Somme) Origin – Who wrote the source? 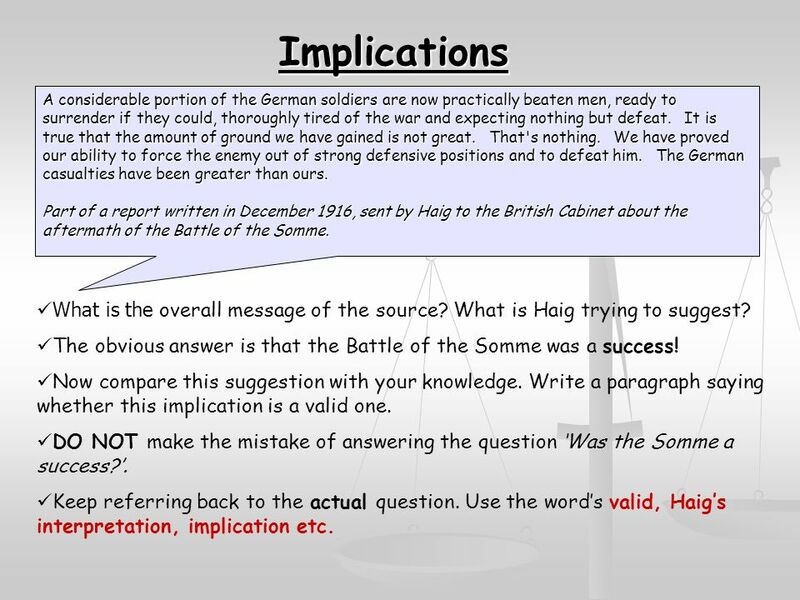 Haig (the General responsible for the Battle of the Somme) Context – When was it written? What was happening at the time? Dec 1916 - Haig was under scrutiny (Churchill had sent a paper criticising him around Parliament in July) Context – When was it written? What was happening at the time? Dec 1916 - Haig was under scrutiny (Churchill had sent a paper criticising him around Parliament in July) Motive – Does he have an agenda? Motive – Does he have an agenda? 1. Perhaps a response to Churchills attack (wrote to the Cabinet). 2. Maybe trying to save his job? Use evidence to show his job was in the balance. 3. Does the falling morale of the British affect his interpretation and thus its validity? Do these things make the source any more or less reliable? Download ppt "Learning Outcome To practice technique of answering interpretation source questions To practice technique of answering interpretation source questions." Lions Led by Donkeys? V By Mr RJ Huggins 2006.  starter activity This painting of the 93rd Highlanders facing a Russian cavalry charge was painted 17 years after the event and so can tell us nothing. Was General Haig… the Butcher of the Somme?. The Battle of Arras 1917 April 9 – May 16. Where is Arras? Arras is in the north of France, right on the Western Front. Many battles have been fought. Warm up What are the two first battles of the American Revolution and what famous quotes come from them? Battle of Somme Vidhi S., Amulya B., Eric K., Austin E.
By Anna, Jeremy, Sharell, Katie, and Min Sol. Cause The Germans wanted Paris. They needed to gain the Verdun land first. Germans knew that they had a. Paper One – Part Two 70 mins The Big Picture Depth Study – Causes and Events of the 1 st World War Why was there increasing tension between. Think back over last lesson Why did the attack on the Somme fail? Jeopardy A?B?C?D?E? $100 $200 $300 $400 $500 ANSWER This is where many of the battles of the French and Indian War were fought. Why was the Battle of the Somme a disaster? Thesis Statements, Topic Sentences and Analysis. Common Openings  To what extent  How much, to what degree, what quantity  Assess  Determine degree.